An inauguration protest in Washington D.C. escalated Friday as protesters broke windows in the northwest region of the nation’s capital, resulting in police using pepper spray against the assembled crowd. A video from NPR reporter Patrick Madden, taken just before the start of Donald Trump’s inauguration ceremony, shows protesters running through streets, knocking over trash cans and breaking windows. Madden reports that police have used pepper spray and a concussive device to subdue the crowd. 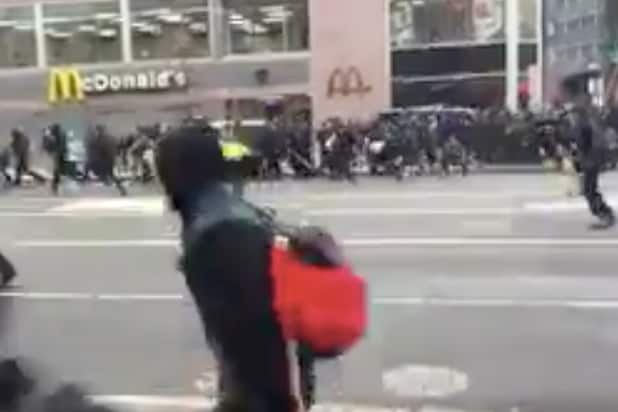 A Periscope video from one protester shows more of the window smashing and police surrounding a group of protesters coughing from the pepper spray. L.A. Times’ Matt Pearce reports that windows at several banks and a Starbucks were broken about 1.5 miles from the Capitol Building. Graffiti with messages including “Revolution or Death” have been sprayed on buildings.